The easy drive from Antequera to Ubeda gave us a false sense of security. The road was new and wide, smooth as a baby’s proverbial and almost deserted. We floated along, looking at the wonderful mountain scenery and wondered why we had felt a bit uncertain about the route. As we drove out of Ubeda the next morning, thinking that the 150 mile drive to Albecete would be another day of comfortable driving, we got a bit of a shock. The new road stopped at Ubeda and became a patchwork of broken tarmac with a few potholes for good measure. We rattled slowly along for the first 50 miles and started to seriously doubt whether we would make it to Albacete before nightfall. We choose not to drive at night, if we can possibly avoid it, especially on unfamiliar roads. Fortunately the road improved about half way into the journey and we could at least speak to one another without being drowned out by the sound of clanking belongings and a hard working engine. As I write this I’m having another of those ‘This is a metaphor for life’ moments. Just when you think the road is smooth and we’re making good progress etc. etc. We were relieved to finally see the outskirts of Albacete and start following the satnav as she took us around the edge of what turned out to be a much bigger city than we’d realised and then into the university district. The motorhome parking at Albacete is new, only opened three months ago and boasts a good, new service area with fresh water, grey and black water dump and five large parking spaces, all free of charge for a maximum of 48 hours. As always, we set off straight away for a walk with the dogs and a look round the neighbourhood. The university is directly opposite and a short walk in one direction there is a Mercadona supermarket. In the other direction – and I must confess to a little burst of excitement when I saw this – is an El Corte Ingles department store. I am a real fan of this chain of stores. They are a bit like John Lewis with a distinctly continental flavour. I rarely buy anything there but twenty years ago I bought a beautiful bedspread in the sales and it still looks beautiful. Quality stuff is lovely to look at, even when you’re only browsing so I was looking forward to a stroll through the store the next morning. We slept well, despite the fact that we were effectively in a car park, and woke up ready for a day in the city. The first shock came when I got out of bed to walk the dogs to find that the temperature inside the van had fallen to 5c. We have a lovely big comforter over our downie on the bed and we snuggle down like hamsters in there, oblivious to the outside temperatures. Getting out into the cold was distinctly unpleasant so I breezily announced that I’d put the heating on. All I got for my trouble was a red light on the control panel. Puzzled I tried again, standing there in my goonie shivering and turning blue. Nothing would light that heating … we’d run out of gas! We couldn’t believe it. No morning cuppa for us, no heating, just a freezing van and two little dogs with their legs crossed asking to go out. I bundled myself up in a weird and wonderful assortment of clothes and shot out of the door into zero temperatures. Those dogs had the fastest morning walk of their lives, dragged at speed to some waste ground and instructed firmly to do what they needed to and back into the van where Shirley had got it ready for take off and the engine running. Albacete we’re sorry – didn’t even manage a short stroll around the city. We were disappointed but needs must. Off we shot into the rush hour traffic in the direction of Valencia, keeping our eyes peeled for LPG, known here as Autogas. Spain is a little behind the rest of Europe in its provision of LPG at filling stations and as Shirley drove I was searching for the nearest one on the web on my phone. We were frustrated to discover that the only one visible was in Valencia city. It was 2 p.m. before we drove up to the filling station and found a long queue right down the street. It had the cheapest prices we had seen anywhere for diesel & petrol so, obviously, everyone chooses it. In the station there were about twelve men on duty and around sixteen pumps. A man steps forward, directs each vehicle to a pump and does the filling for you. Ours got us onto an Autogas pump, sourced the correct connector and filled us up. It’s customary to give a small tip for this service and it’s worth every penny. Filling our onboard LPG tanks is something I’ve never got used to – there are signs warning you to be careful of ice burns and the whooshing noise it makes when you disconnect is a bit scary. The guy on the pumps wore special gloves and I made a mental note to get some to carry in the van. … is convenient for the metro line into the city and we appreciate it for its excellent facilities, friendly welcome and reasonable prices for a big city. We decided to stay a few days, give the van a really good clean inside and have a day in Valencia seeing the sights. We were calculating that we have lived in the van for 40 weeks out of the last 47 and by the time we get home mid March, exactly one year after we started our adventure, we will have lived in it for 45 weeks. We have spent only four weeks in our house, two in Adrian and Rachel’s while they used the van and one on holiday in a rented cottage with pals. No wonder the old girl is getting a bit creaky – and the van too. We regularly do a good clean but we knew it was time for a real blast, getting into all the dusty corners and vacuuming under cushions and under the bed. We were astonished how much dust we found hidden away. By the end of the day we were exhausted and sneezing like one of the seven dwarves. Washing was hanging outside, dog blankets washed, cushions beaten and our trusty rechargeable Dyson filled and emptied several times. Feeling virtuous, we rewarded ourselves with traditional paella from the site restaurant – lovely. We love the way that motorhome travelling gives us the chance to meet lots of new people and to enjoy the rich diversity there is in just being human. One of the people we met at the Camper Park was an English guy who had decided to sell his place in the UK, buy an old camper and come over to Spain to think about relocating permanently. It turned out that he was a musician, something we only discovered when he brought his guitar into the laundry room where Shirley was hand washing the dog blankets and recorded the beginnings of an idea for a song. How nice to be serenaded while doing a less than favourite job! They had a long chat about Brexit, the sad rise of racism after the vote and his realisation that he needed to get away to somewhere new. We never did get to know his name but he was a cheery presence at the Camper Park and clearly popular amongst the other residents. There is an ebb and flow on a campsite or camper stop that constantly brings new small communities of people together where they can share a little of their lives for a while, if they so wish, and then separate again to go their different ways. Sometimes I think the world would be a better place if we were willing to be like this all the time. Just a wee heads up if you are considering stopping at Valencia Camper Park any time between now and early summer and have a dog. On the roads outside the park there are hundreds of processionary caterpillar nests in the pine trees. The owners take great care in the park and reassured us that their grounds are kept free of them but walking anywhere nearby is a real problem for dog owners. They hadn’t started moving from the trees when we were there but the nests look like they’re ready to drop at any time. Here’s a confession. We haven’t found the wow factor in Valencia yet. This was our fourth visit, the third one doing the tourist thing and we still don’t like it very much. I know from previous feedback on the blog that other people love it and that just confirms what I was thinking earlier. We’re all different and we like different things. Personally I love that diversity … but so far we haven’t fallen in love with Valencia. This visit started well. We like the Metro. it’s quick, efficient, clean and gets you right into the centre for the amazingly small sum of €1.50 each way. The Camper Park loaned us travel cards with credit on for a small deposit and we only had to pay for what we used when we handed them back. We were soon zooming into the city and looking forward to taking a look at some new places, visiting the big food market, which we know is wonderful and taking a stroll through the streets. It didn’t help that within a couple of hours the heavens opened and we got drenched so our less than positive view probably had a bit to do with that. We visited El Corte Ingles to make up for the disappointingly rushed exit from Albacete, wandered around and bought nothing except a new pack of cards and a light lunch. That’s our kind of shopping! By the time we got outside we managed only a short walk before the rain came on, making our tourist map wet and droopy along with our moods. There are some lovely buildings, it’s true, and we would have made a bigger effort if it wasn’t for the rain. We’d forgotten that the food market is only open until early afternoon so we missed that and we were soon tired of dodging puddles and crowds of listless sightseers. Eventually we gave up and went back to the Metro station, realising as we did so that we’d completely forgotten to get an idea of the times of the trains. As it happened we had just missed one and sat for more than half an hour gently steaming in the underground station. Ah well. Maybe next time. We have a ferry booking from Ijumuiden, the port for Amsterdam, on March 16th so we are now calculating our route more carefully than we’ve needed to up to now. We have a couple of ‘must dos’ on the way. As I write this we are parked on the sea front at Sitges, here to visit Shirley’s brother Chris and at the end of the month we will be visiting Shirley’s old friend Julie in Marseillan in the south of France. I should make it clear that the term ‘old friend’ refers to the years they’ve been friends not to her age. We don’t want to get too far north too soon as it will inevitably be colder, but neither do we want to be hammering up a motorway at the end of the trip. Suddenly careful planning is a necessity and we’re not sure how we feel about it. We stopped on our way to Sitges at a Camper Park inland from Calafell that had electric hook up. Once again I am starting to believe that the batteries are recovering, now that we have a good charge from the solar panels, so we keep giving them some extra encouragement in the form of electricity. I know more about 12v leisure batteries now than you can shake a fuse at but it’s still horribly confusing. Opinions about types, necessary levels of charge and how to take care of them are varied and some people on internet forums can get quite upset about it all, demanding that their opinion is correct and everyone else is wrong. Every time I think I know the answer someone comes along and tells me I’m mistaken. Oh dear. I am reminded of the lovely Iain who installed the solar panels. When I tried to engage him in discussion about the state of our batteries and whether they might recover he just kept suggesting I waited patiently and perhaps more pertinently said, “Beware of anecdotal evidence”. I think Shirley is going to ban all discussion about batteries soon, especially when we’re walking along a beach looking at a lovely sunset and I start a conversation with, “I was thinking about the batteries …” Shirley is a patient woman. Anyway, we found our way, with quite a lot of difficulty, to the Camper Stop in Bellvei, inland from the coast. The satnav, set to the proper dimensions of our van, appeared to believe we could drive up a turning little wider than a footpath. Eventually we found it by getting out and walking there then going back for the van and taking it down proper roads that were there all the time. Even the satnav can’t be trusted to do it’s job. We pulled into the park and found several things to like and a couple of things that made us realise we could only bear to stay one night. The site was well laid out, well equipped, had plenty of places to walk the dogs, good wifi and there were friendly people already there. There were also two noisy German Shepherd guard dogs immediately on the other side of the fence determined to enter a barking competition with our dogs and we were about 50 yards from a very busy railway line. The white flash is a high speed train at the other side of the meadow. Too close for comfort. A restful night it most definitely was not. The next morning we left for Sitges but not before I had had another discussion about batteries with our next door neighbour and tried Shirley’s patience a bit more. 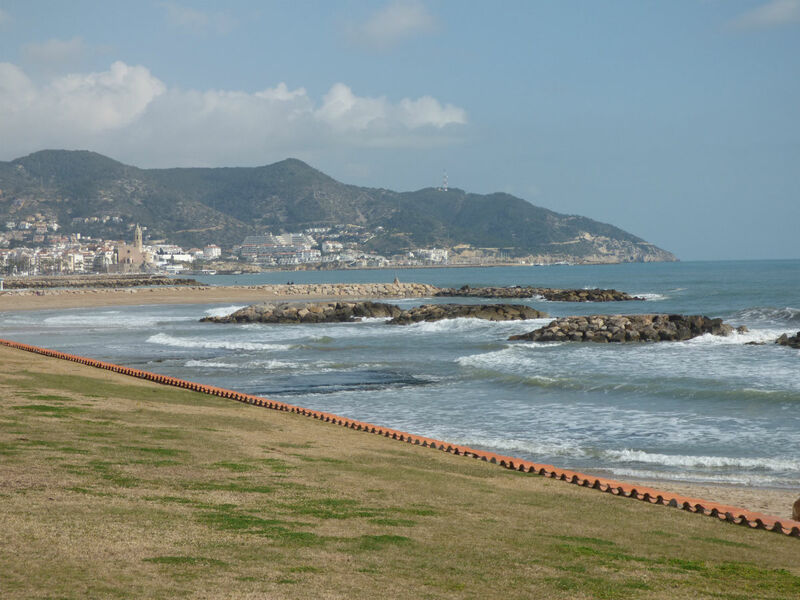 We love Sitges. It is charming, friendly, upmarket and relaxed all at the same time. In winter you can park on the sea front free of charge and listen to the Mediterranean lapping on the shore less than twenty feet away. We opted to move to a quieter spot to sleep and were not bothered by anyone. Everything relaxes out of season. We have been out for meals and coffees with Chris, walked miles up and down the prom and given the dogs their most favoured treat – a run on the sands. Walking with Chris and Bambita, Our dogs very rudely ignored her. Tomorrow we move north for our last stop in Spain and the journey home draws ever closer. See you in L’Estartit!